If philosophy is the forensics of politics, identity is resurrected by the archaeology of ideology. In the laboratory of mankind, new leaders have created themselves by experimenting with causes that can be condensed into a single word. 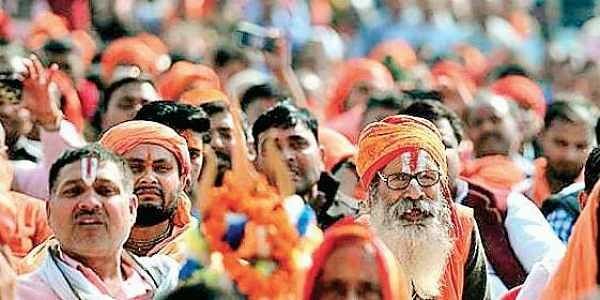 India has found its ultimate adjective—‘Hindu’. A century later, a sociologist may spell the contemporary Indian ecosystem with the H-word. With this election, the political and social Hindu comes of age, led by Narendra Modi’s powerful imagery and vocabulary of a new India. An India guarded by a billion chowkidars, avenging its soldiers with bullets and bombs, a new space power—in short, a land on the threshold of greatness as the new, living cradle of Hinduism. Development and delivery is absent in the poll vocabulary not necessarily because performance is zero. A great beast was awakened half a decade ago. All else is drowned in its roar demanding fealty to its rider. Modi uses the H-word to reach out to India, even as he turns the narrative of his foes on themselves. “History shows not a single Hindu involved in terror,” he mocked the verbology of ‘Hindu terror’. Rahul Gandhi retorted that he was a Hindu, too, quoting the Gita and accusing Modi of not being a real Hindu. Modi loyalist ministers labelled Rahul a wannabe Hindu. Meanwhile, Yogi Pradesh, the heart of the Hindu belt, religious defiance upped the ante: the Dadri lynching accused got the front row at political rallies. The CM outrageously called the Indian Army “Modi Sena”, evocative of Ram’s vanara sena that destroyed Ravan’s Lanka. Only the regional parties have stayed away from the faith war being waged between the BJP and Congress. The Congress is an impostor in the religion race, having lost the plot. It misread history. The Mughals did not write textbooks; in fact, Akbar was an illiterate. It was the British who replaced gurukuls with rote. They were afraid of India’s gigantic majority enough to subvert its cultural self-confidence, co-opting the upper classes and dividing the others. Post-Independence textbooks project Hindus as weak and passive, betrayed by rajas who were Mughals and British toadies. Shivaji and Rana Pratap were the few exceptions while the jury is still out on Akbar’s Rajput general Man Singh who walloped his kin at Haldighati. The colonial education system pictured triumphant Muslim invaders and benevolent Englishmen redeeming India’s ‘pagan’ majority. History is written by victor. But it never forgives the victor either. Most decolonised countries descended into dictatorships and chaos except America, Canada, Australia et al. In the Third World, India alone has held steadfast to democracy. No philosophy or ideology in the world is immutable. Democracy is changing, too. All across the world, liberal socialists are fighting a losing war against the nationalist surge. Modi is redefining Indian democracy by upending established notions of code and conduct. “Not my India,” lament some. But Modi’s India is in no mood to apologise.